“Hhhhhere we go again,” Jason Argonaut, the furry python and minister of mining and industry said, curling into a tight ball on my desk. Being shot, being expected to make the lives of every unit perfect—anyone that wanted to be president needed to have his or her memory sump examined and declared a mental defective, I thought. I didn’t mean that in a facetious way. Since I’d allowed my people to bully me into becoming president for life, I’d had my sump and processor checked at regular intervals over the last nine years, three hundred fifty-three days. Despite my misgivings, my personal Nurse Nan consistently pronounced me sane. “They each have their own contributions, some measurable and some not,” the giraffe said, twisting his neck around and down to look the gopher in the face. To my great surprise, Martin Luther, my chief of staff and a black-and-yellow spider, sat silently with his eight legs tucked under his body, keeping his height down from its normal 3 meters. That height had once saved my life as he’d jumped on top of me to take a falling girder on his back rather than have it crush my skull. It cost him three weeks of repair time. I visited him in the shop several times. Our conversations showed that our views matched on so many topics. What started as gratitude bloomed into friendship. Now he spent his time protecting me politically instead of physically. As a result he watched the discussion but didn’t interject commentary. “It’s because of those damned units that won’t listen to science,” the gopher said, waiving his stubby arms in derision. “SHUT UP!” I bellowed slamming my great paws, one purple and one white, down on the desk. Its boxwood creaked under the force of my hydraulic tantrum. Everyone froze. I suspect it had to do with the fact that I rarely lost my temper, a trait shared by most teddies. Come to think of it I couldn’t remember the last time I yelled about anything. I tried to lower my hydraulic pressure by looking out the windows of the Oval Office. I watched the sun cresting the One Hundred Eight Hills, named for those I’d let die discovering there were multiple Factories on this planet. The crimson light shined down on the mass of toyanity that carpeted the western faces of the Valley of Six waiting for the life-giving rays. Scorpions vied for space with teddies who snuggled up to Nurse Nans who shared with bouncing balls and even fabric dolls. Ninety-six different species of toys all looked to me, a humble 2-meter teddy bear, as some Human able to solve any problem that might present itself. The stovepipe hat that balanced between my purple ears chose that moment to shift forward and annoy me. The black hat had started as an affectation—something I could do to make myself feel a bit different from all the other teddies. Instead, the toys of my world imbued the hat as the symbol of the presidency itself. Now they expected me to wear it. I had no one to blame but myself. I took the hat off my head and put it on the corner of the desk. For ten years, less twelve days, we’d had no physical war on the Toy Planet, sometimes still called Rigel-3. Instead, now I fought wars of legislation that ranged from approved sunning locations to monetary policy. Instead of a gun I used a pen. Often the paper threatened to break over all my defenses and massacre me. “I’m sorry, Mr. President, but the Congress has agreed. They are sending the completed Procreation Limitation Law for your—” Frank started. “Mr. President, if you sign that law then we will have even more racism in citizens picking only what they consider to be the best offspring. We already are seeing a severe reduction in birdies and elephants,” Charlene Darwin, a Nurse Nan second only in height to the giraffe, said, eyeing my bodyguard. Sancho, a pink and purple polka-dotted elephant had rarely left my side in the eleven years, eighteen days, thirteen hours, and some number of increasing minutes since I activated him. He assumed a self-appointed post as my lead bodyguard. His zeal created multiple incidents where he’d damaged beings when they only appeared to pose a threat. On the plus side his well-known fervor did keep me from being mobbed everywhere I went. Charlene, clad in her white uniform with the bright red plus, brought up the SAN, Specific Area Network, to show a real-time feed of the procreation queue leading up to Factory 55466’s massive dome. Pairs of toys, or the occasional single parent, lined up as they had for the better part of ten years, talking and sharing among one another the choices they’d made for their breeding. The image zoomed in on audience chamber just as a paired penguin and model car went in together. “Number of parents?” said an automated voice. “Two,” the penguin and car said together. “We’d like to create a teddy bear, please,” they said in unison. “See? What did I say? Teddies are on a rise,” Charlene said from her plump, almost-human face. “That’s just one pairing,” Frank retorted, gnashing his buck teeth. The SAN image showed the manufacturing door opening to slide out a white 2-meter-tall teddy bear with dark green stripes across its torso. It remained motionless in the middle of the room. No one knew why units no longer came with preprogrammed information. Once they’d been able to march out ready to defend their Factories. Now they manufactured as nearly blank slates, needing to be taught all but the most basic skills. “Are you ready?” the penguin asked its partner. “Yes—I want this,” the car replied. The car waited patiently as the penguin opened up its vivid red hood. Then the black-and-white creature stuck a long needle into a bulbous area near the auto’s firewall drawing out 10 milliliters of amber brain fluid into the syringe. The penguin waddled over to the immobile teddy. It’s flippers pawed through the white fur before finding the sump access. With slow deliberation it shoved the same hypodermic into the head of the teddy, squeezing the viscous teddium-laced fluid into the bear. “Time to go home now,” the penguin said, taking the bear’s white paw. As the trio left Six’s dome, the car went off in one direction, its job done in impregnating the child with sentience, while the penguin led the child off to be raised, to learn how to be a toy. I think had I been a Human that I would have cried with joy. I had no tear ducts. Instead, my voltage dropped gently down to a low power state. Things were right on Toy World, if not in my office. “And you want to stop that!” Charlene said, bending down to look at Frank, eye to eye. And my voltages surged back up. So much for my small bit of happiness. “Not ‘stop it.’ We never wanted to stop breeding. We just need to limit it so we don’t overrun our resources. “Mr. President, I have to insist that you discuss this new law with the Factories,” gopher Wright continued. The sound of the safeties of the dual independent machine pistols mounted in Sancho’s chest echoed in the silence of the Oval Office. Six, my original manufacturing Factory, had replaced Sancho’s chest mortar with weapons more conducive to bodyguard work. The cabinet knew that Sancho ignored personal rank and took direction only from me. If even my chief of staff were to open his mouth he wouldn’t talk again until he’d had his speaking apparatus replaced. “Much better,” I said after several dozen rotations of my hydraulic pump in blissful quiet. “You folks, along with the Fellowship of Human Worship, the Lobby for Racial Purity, the United First Brotherhood, and the National Organization of Equality, have filled my sump with all of the consequences of signing or vetoing this particular bit of legislation. Sometimes I don’t think I’ve ever heard of anything else. “We are going to play a little game. It’s called ‘Don’t ever bring it up again.’ Am I quite clear?” I rocked my head up and down in an exaggerated motion. The rest of the heads, excepting Sancho’s, nodded in time with mine. No one spoke up, but Frank Wright pointed his tiny, brown finger at Sancho. “Ferweet,” Sancho said, in a tone I took for disappointed. He didn’t care for some of those in the room and would have been pleased for the opportunity to teach one or more of them a lesson. “Eighteenth, actually, Mr. President,” Charlene Darwin corrected. “OK. What legal fiction have they invented this time?” I asked, wishing this would just go away like mercury rivers carrying away unwanted wastes. “Excusssssse me, sssssssir?” Jason the python asked. “This is more inventive and makes the unit question themselves,” I said as I gave positive body language. “Sir, the Human Cultists have at least a prima facie claim,” Lewis offered. “Thank you, sir,” the gopher said. “Well, personally, I think all those Human lovers should be melted to slag but thank you for at least listening to the issues I bring to you,” Wright said. “I don’t know what you are talking about, Mr. President,” the gopher Wright responded. 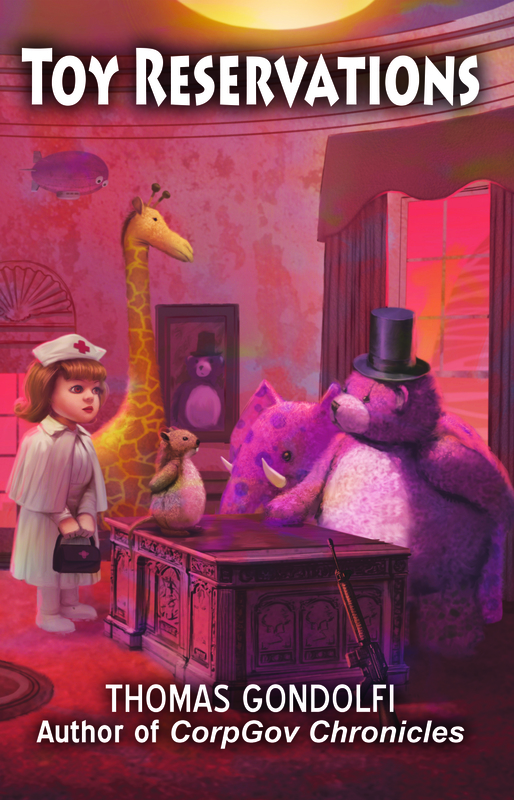 A light tap at the outer door was followed quickly by a lime-green and blue teddy walking through the doorway. “Ferweet,” Sancho said, walking out the door. Sancho preferred the night shift so he could bask his rotund belly in real red sunlight, not the full spectrum of artificial lights. “The Peace Day celebration five days from now?” Martin Luther offered from the middle of the rug pointing one of his eight spindly legs in emphasis. “We thought it would make a nice backdrop to have that displayed behind you as you give your speech, Mr. President.” Nods around the room punctuated my chief of staff’s comment. “Where?” I asked just wanting to get this over. I had an appointment soon and hadn’t made the key decision. I wanted time to think it over but knew these vultures would take up every millisecond I let them have. “We thought in front of the 55474 monument. We thought it fitting that we have it on the site of the last battle of the war, sir,” Martin continued. As they left, I soaked up power from the WAN. With no one clamoring for my attention I realized that for the first time in years the Oval Office lay silent. Oh, I wasn’t alone. A copy of the Procreation Limitation Law stared at me from my desk. My bodyguard Indira waited for me to make another decision that would affect 6,346,803 units and uncountable yet unborn offspring. No matter how long I looked at the paper, it didn’t change, nor did my sump come up with a clearer decision. I only had three choices. Let the PLL continue and become law without my approval, which would pave the way for a potential repeal at some future time. I could sign it and make it ironclad for all time, or veto it and open up the option of an override. I sometimes wished for easier choices. The door opened to admit my aide, Rodney Dangerfield, a roadrunner with the biggest eyes I’d ever seen. “Beep-beep,” he said aloud, followed immediately with, “Sir, it is time for you to leave for your appointment,” over the LAN, Local Area Network. “Yes, sir,” she said. I caught “Jefe is moving,” over my bodyguard’s SAN, Specific Area Network. We walked across the White House’s western lawn. The Secret Service kept the normal protesters to the east side of the building. No one begrudged me my direct path to one of our Factories. Six hadn’t spoken in nearly a decade except in automatic responses to requests for offspring. The stone walkway from door to door was a nice, if unnecessary, touch. The procreation queue stretched off to my right as I approached Six’s audience chamber. Police held back the throng as they watched me jump the line and headed right into my creator’s presence. “Yes, Mr. President.” She arranged herself to guard the door itself. Walking into the 6-meter open dome intimidated me more than facing a horde of unit devouring basilisks or dozens of Procreation Limitation Laws. “Number of parents?” came Six’s voice. I hesitated. I didn’t know. This was my fourth attempt to choose my offspring. Many would argue that the entire toy race were my children. All sentience had originated from the material in my brain known as teddium. But this was different. I would raise this unit. Share with it not just my brain fluid but teach it everything it would need to make it in our world. Should I create another teddy, another me? I knew what it meant to be a teddy. Or was Lewis Tappan correct and I should ask to raise one of the toys that weren’t popular to show my support for diversification? But what did I have to offer a balloon? I knew nothing of floating on the winds. There was much to be said for the intelligence and skills of a Nurse Nan, the grit and determination of a dump truck, the single-mindedness of a dragon, the artistic streak of a toy piano, the beauty of a unicorn, or even the enthusiasm of a toy car. Undaunted I’d charged into machinegun fire and fought a basilisk with my bare hands. I’d never had my voltage streaking upward so fast. The chamber seemed to close upon me, not centimeters at a time but meters. Would it crush me? I bolted out the doorway with a speed that surprised even me. A cheer rang out from the people waiting. My processor couldn’t decide if it was because I was done and they could get in, that I’d chosen not to create an offspring, or that they were just happy to see me. None of that mattered. I needed to get away. “Back to the office, sir?” Indira asked tactfully, not asking about my state, departure, or that I was alone. “Yes,” I said, grabbing onto any suggestion that would get me away from that room—that room where my reason failed to come to a decision about what toy to create. I maintained at least a modicum of dignity. I didn’t sprint to the White House. I walked—fast. Every step away from that place eased my voltage and made me walk all that much quicker. Once I got back to my office, I took the time to look at my paws in the full spectrum light. One paw was brilliant white and the other deep purple. I spent too many years out in nature having my fur cast in the pleasant burnt cinnamon colors of our sun. Now those brilliant colors blurred as my limbs shook. I brought down the remaining overvoltage manually. I knew there was nothing to be afraid of, but that didn’t seem to make a difference to my body that acted more like a newly manufactured child. I flopped down in my chair. Why did such a simple decision panic me so? Because it isn’t simple! my mind screamed. Some unit that wasn’t quite here yet counted on me to make the right choice, to do the right thing, to make it the best it could be. “Sir, could I interest you in the White House’s patio garden?” said my assault-rifle-wielding bodyguard. Indira just looked at me with that blank unit stare. “Yes, sir,” she said with her ears drooping in disapproval. “Jefe is moving. The word is El Capitan,” her voice called over the net, containing none of the judgmental tones her body language held. Studies showed fully 85.8 percent of all toys believed in the Humans as our gods and the creators of everything. The Fellowship of Human Worship, the most militant and radical of the Humanists, wasn’t more than 0.3 percent by population but their placards and speakers were heard anyplace they thought they could draw attention. They even regularly clogged up entire WAN frequencies with their propaganda before being shut out by local traffic managers. I understood the desire for everything to have a meaning. I could even empathize with the desire to let someone else make the hard decisions for us. What I couldn’t wrap my head around was the desire to make everything either forbidden or compulsory. Why have free will in that case? Why not just be automatons? Surely the Humans wouldn’t want that. “Sir, we are ready now,” the detail leader said with criticism dripping from her voice. I put Indira’s pique behind me by ignoring her and the rest of the squad of bodyguards that flanked me within seconds. The White House’s garden always fascinated me. The weeping fly tree, nearly healed from the damage done to it during the war, stood as the garden’s centerpiece surrounded by hundreds of exotic and mundane species of plants, flowers dotting the 1.34 hectares. The tall, tinkling bell-lilies from the slopes of Mauna Loa Prime mingled with the ground cover of the black-and-white tuxedo flowers. The local palm-like plant, bloodweed, stood side by side with spindly, blue, cone-top flowers. The gardeners even transplanted one of the semi-mobile pink and crimson tangle-vines. I thought it a dubious addition as one had tried to eat me once. My dislike didn’t stop me watching in fascinated horror when they weekly fed it a rock crab. The Central River flowed by the forward edge of the garden singing its metallic song as the mercury flowed against the rock banks. The Memory Bridge, a stone pedestrian bridge with its sides carved with names of each of sentient toys that died in the war, arched over the railroad and the river. Aside from the constant protests, this side of the river was calm, reserved for the government, Six’s dome, and of course the White House itself. By contrast the other side gave way to the hustle and bustle of the Valley of Six. As the center of all unit activity and commerce, the place looked like an artist had flung eight thousand different colors of ink at random against a canvas. Not happy with this amount of chaos, he made the tableau three-dimensional and had the paint splotches all move and talk. As much as I loved the marketplace, I hated the statue. A human-damned bronze statue at the base of the bridge on the other side was a thorn in my fur. The colossal 20-meter likeness of me stood in the center of the town square surrounded by people travelling about their normal business. The Congress had moved the funding for it surreptitiously. I’d been horrified when it crossed my desk. I’d vetoed it instantly. I even went and begged the legislators not to override my veto. I got exactly one vote, two fewer than when it had been passed originally. Now the darkened patina only shined where the passing units rubbed the feet of my likeness for luck. Luck! My people make me wonder at times. I spurned the statue and let my thick legs take me through the stalls of merchants and crowds. The bedlam of color and activity reminded me that we were all free. We all could make choices of not only life and death but of inconsequential things like color and jewelry. My people lived and embraced their liberties. Maslow was no dummy of a Human and his hierarchy applies to units, too. We needed energy to keep our pumps active, as well as maintenance and lubricants. Reaching higher we crave security, order, and stability. Once those are established, units could move on to belonging, friendship, differentiation, and so forth. As the first two layers are now so easily obtained, our people poured a great deal into making ourselves unique. The decoration industry was the second largest on Toy World. “Fur dying! Painless piercing!” called out one red, white, and blue striped octopus from the entrance of a tent. As I let the calls of the vendors flow over me I remembered how in our earliest days our government debated even having a monetary system. In the end, everyone needed to contribute. We needed a way to recognize that contribution and money was born. We used what kept us alive as our coin—ergs. “A Humanist with a sniper rifle could tear apart your brain sump, sir. That would be worse. Could you not stand still so long, please?” Indira urged. “Sorry,” I said, pushing into the dense crowd of units. If I didn’t need my solitude I might have just turned back right then. Yet rubbing shoulders with my people in the crowd of toyanity recharged me in a different way. I could see the soapy bubbles of a lawn mower floating up into the air before it came into view. A silver and pink ball rolled into my shin. With no mouth it sent me an apology over the LAN as it moved around my legs. A penguin waddled down the aisle toward me in its distinctive wobbling gait. It shoved out its chest, emblazoned with the simple stick-figure of a human, a clear symbol of a member of the Humanist Movement. I didn’t need Indira to tell me that it was a risk I should avoid. I turned down an intersection at hand leaving the potential danger behind me. At the same time I made a wide path around the Well of Souls, the religious shrine where Isp had spilled his sump fluids upon the earth. Now Humanists made pilgrimages from all over Toy World to release a few drops of their own fluids onto the soil. I shuddered. Arena combats I would have outlawed if the Congress wouldn’t have overridden my veto. Too many units derived vicarious pleasure watching two toys beating the stuffing out of one another. Toys would climb into a heavily shielded pit and fight unarmed until a victor emerged. To prevail, you must injure your opponent until he can’t move. Torn out hydraulics and/or pumps were common. Sump casualties were rare but did happen. My attention returned when the tightly packed crowd parted as a Tammy dress-up doll walked through. In the past the vast portion of her molded body would have been plastic explosives. Even if she were still armed, did those in the crowd really think the 1.65 meter space they gave her would really save them if she decided to detonate? An orange dragon, snorting smoke rings from its nose, negotiated with a furry-legged spider over a necklace of shells. A hippo lay on its side getting its large hide inked with the image of the Mauna Loa volcano. A baby-doll, crying as usual, tried on hats in a millinery. Our freedom showed more in Six’s Valley, 854.696 hectares of crowded space, than any other place on Toy World. Even our Congress couldn’t make that claim. To my great surprise I managed to traverse the entire 2.3 kilometers through the marketplace and exit the other side without being recognized. One moment I have units pressing in on every side of me and the next I couldn’t throw a rock far enough to hit one. It transitioned as radically as if the Humans themselves scribed a line in the earth. I could feel the emotional pressure of the Local Area Networks ease off my conscious as I strode away from the mass of my people. I spent most of my walk tossing the advantages of one form of offspring over another. I reached my destination one point six hours later and had gotten no further than deciding I didn’t know. The 308-meter-tall, ragged cliff-face stood cold in the purple shadows. Digging my claws into a crack in the rocks, I lifted my weight off my feet. On the climb up I’d be alone except for the dirigible and circling pair of windup planes that had to be more of my bodyguards or they would have been driven off by now. A stiff breeze ruffled my fur as I climbed. It swirled and tugged at me and threatened my purchase on the granite. I felt only the slightest overvoltage of fear. There is something about the risk of one’s life that cleared the sump of irrelevances. While technically difficult, the climb left my processor free to ponder the reasons I’d come to be alone in the first place—the exile of Isp, procreation, and peace—very different topics. Had I been wrong to exile Isp? I’d asked myself that question frequently over the last ten years. As always when I thought about this topic my temperature probes registered a sudden drop in temperature unrelated to my surroundings—something I associated with what Humans called guilt. Did anyone deserve being caged? I justified in my head with But they had so much space. Holding onto a rounded stone outcropping with both paws, I looked up. I needed another 12.3 meters before I reached 40 meters worth of chimney. I swung my legs up to an edge. This allowed me to bridge myself up to the next handhold. Nine years and three hundred fifty-three days ago the pointless wars had been finally over. The general population of units backed me when I wouldn’t kill Isp. There had been enough killing, but something had to be done. He’d tried to enslave all units for his twisted vision of the world and humanity. The peninsula of Baja in the North Polar Sea had seemed Human-sent as a reservation, a place of exile, for those few who would have harmed toyanity. At 71,793,911 hectares in size, that gold, demented bear and all his teddy followers had been allowed to practice their way of life. The violent motions of the ocean bound them on that large spit of land. Just to be sure there would be no escapes, we posted non-teddy troops across the narrow strip of land between Baja and the northern edge of Avalon. “O God, I could be bounded in a nutshell and count myself a king of infinite space . . .” I said aloud. As a sop to our collective consciences, we offered preventative maintenance and lubrication at the checkpoint as they were unlikely to manufacture it for themselves. After placing the offending units into Baja, we’d seen not a single unit for two months. Then a large group of the furry bears recanted their extremist religion. Humanists could be neighbors. Human Cultists could not. We tagged them to keep track of their movements within our society but let them go. Before leaving they had told us that Isp was even more insane than we had feared. He was cannibalizing units for their fluids and parts for those he held in more favor. My upward travel broke my train of thought. The parallel cut in the rocks proved too small for my body, but I could wedge both my arms in and use them to hold me up while my feet pushed me up to where the chimney was wide enough to accept my body’s bulk. Instead of gently pulling myself into a rock crevasse, my head violently smashed into the rock face. The crack of a rifle bullet sounded one point four seconds later. I felt fluid as it oozed down my face. With one free hand I dabbed it and saw the amber of my teddium brain fluid before my hydraulics locked up to prevent my fall. My processor registered massive damage to my head. I couldn’t believe I was terminating. I couldn’t remember what I should do. I—who was I? How would I clean my fur of this ocher flui . . .